Coming from SANFL side Port Adelaide, Wakelin had a strong debut season at St Kilda in 1994 when he played mainly as a half-forward and did well enough to earn an AFL Rising Star nomination. He subsequently made his name as a defender, but the Saints cut him and twin brother Darryl from their list when Malcolm Blight took over from Tim Watson at the end of 2000. Collingwood took a punt on him with a selection midway through the National Draft and he repaid the faith with a solid season in which he missed just a single game. In later years, he admitted that he had lied to coach Mick Malthouse when asked about the extent of his Achilles problem when the coach had interviewed him about coming to Collingwood. He was one of a band of experienced players who added substance to the Collingwood side and in 2002 enjoyed one of his best seasons, finishing fifth in the Copeland Trophy. He played in the Magpies’ Grand Final sides of 2002-03, locking horns in several engrossing duels with Brisbane’s Alistair Lynch and getting the better of him on several occasions. Wakelin was a stalwart in defence in 2004 until he broke his arm and missed the final six games of the season, and his third placing in the best and fairest of 2005 was his highest individual honour. His career began to flag as a young group of Magpie backmen, led by Nick Maxwell and Heritier Lumumba, became senior players in the years that followed, but instead of fading into the darkness, Wakelin enjoyed an Indian summer. After playing just four games in the first 10 rounds of 2007, the then 32-year-old Wakelin returned for the Queen’s Birthday clash with Melbourne and missed just two more games as his side shocked the competition by charging into the Preliminary Final. During the finals series, Wakelin performed admirably on the likes of Barry Hall and Cameron Mooney and typified his team’s fighting spirit with a one-handed tackle on Mooney at a critical stage of the epic Preliminary Final. 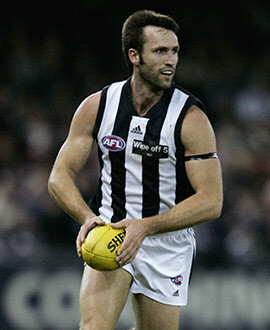 In 2008, Wakelin’s renacconce continued, managing 20 games in his final season at the age of 34. He was caught in the crossfire when Barry Hall took a swipe at hime durng the team’s visit to Stadium Australia in round 14 and he notched his 250th career game in round 20, fittingly, against Port Adelaide, the club at which he played much of his junior football. Although he missed the Elimination Final, he returned for one last hurrah against his old club St Kilda in the Semi-Final. To the end he was an honorable and respected footballer who fashioned a proud record, and later returned to St Kilda where he worked in the club’s administration.